Watsoo Express specializes in providing high quality Milk Run services. We professionally pick up items from each of the suppliers with GPS-enabled vehicles and deliver goods in the stipulated time period. Our Milk Run service is designed for metro cities, inter & intra state movement of your valuable goods with a GPS enabled vehicles and special security features like geo-fencing, digital remote lock system etc. 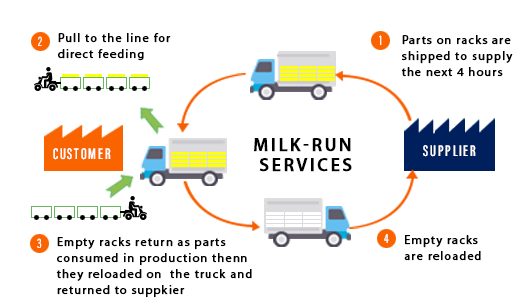 We also provide software for planning of routes in milk run service which helps plan your distribution with maximum output within minimum time to enhance the overall performance. We provide MILK RUN logistics services and solutions with utilizing technology to maximize the volumes made in each trip as orders flood in real time. We ensure that the minimum distance is travelled and maximum load is carried out into the vehicles so that the demand of the cost-effective transportation can be met. We have developed our milk run solutions in a way so that no truck returns empty-handed which substantially brings down delivery capacity.